For many thousands of years, from the days of Atlantis and beyond to the present generation, color and color rays have been used for the purpose of healing. 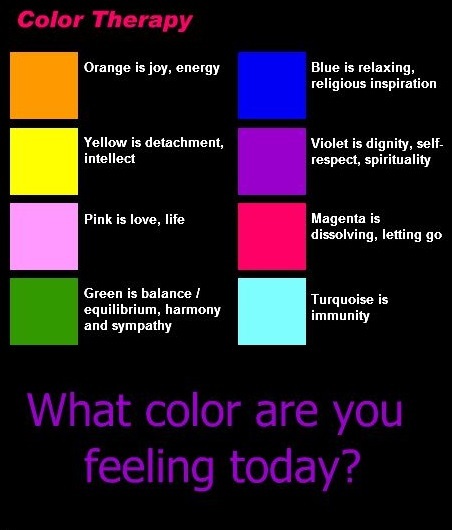 it is therefore quite apparent that color exerts an extremely powerful influence upon all our minds and emotions. Color is not a lifeless, static, phenomenon, as many people seem to think, but, in reality is a vital force, a very strong power and influence over all of our lives. Knowledge, judgement and intuition are all combined in the capable management of color. It is a discipline. Color is everywhere, on all planes of existence, as vibrations are everywhere and color is the manifestation of vibration. the universal light, the sun, emanates vibratory streams of life force in seven major rays. color in the aura indicates the positive quality application, force and will. Weak, faded or dull tones in aura indicate lack of force and instability. Some colors are warming (red, orange, yellow); some colors are cooling (blue, violet), while (green) is neutral and a balancing color. The more light that man attracts to himself through spiritual living and high ideals, the more beautiful will become the colors of his aura. The highly evolved man will have only positive tones, properly balanced and controlled. He will appear to be surrounded by rays of light which will be soothing and luminous. In some, the auric colors are clouded, dull and unpleasant to see. There may be clouds, flecks or even holes in the aura, and one can usually intuitively tell if reasons for these imbalances are due to stress, illness, weakness or the taking of chemicals (drugs, alcohol, poor nutrition, smoking). Colors and crystals can be used in all healing as a universal therapeutic tool, upon all levels of metaphysical existence. Color therapy is used widely in healing centers to promote physical, psychological and spiritual well-being and to bring people to their full potential.